The first time I was playing around with 5.0 and particularly HA I noticed a new section in the UI called Datastore Heartbeating. Those familiar with HA prior to vSphere 5.0 probably know that virtual machine restarts were always initiated, even if only the management network of the host was isolated and the virtual machines were still running. As you can imagine, this added an unnecessary level of stress to the host. This has been mitigated by the introduction of the datastore heartbeating mechanism. Datastore heartbeating adds a new level of resiliency and allows HA to make a distinction between a failed host and an isolated / partitioned host. Isolated vs Partitioned is explained in Part 2 of this series. Datastore heartbeating enables a master to more correctly determine the state of a host that is not reachable via the management network. The new datastore heartbeat mechanism is only used in case the master has lost network connectivity with the slaves to validate whether the host has failed or is merely isolated/network partitioned. 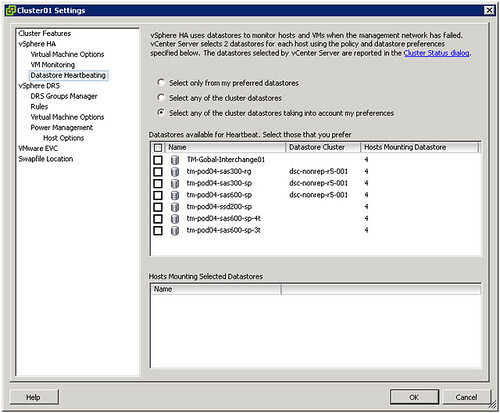 As shown in the screenshot above two datastores are automatically selected by vCenter. You can rule out specific volumes if and when required or even make the selection yourself. I would however recommend to let vCenter decide. As mentioned by default it will select two datastores. It is possible however to configure an advanced setting (das.heartbeatDsPerHost) to allow for more datastores for datastore heartbeating. I can imagine this is something that you would do when you have multiple storage devices and want to pick a datastore from each, but generally speaking I would not recommend configuring this option as the default should be sufficient for most scenarios. How does this heartbeating mechanism work? HA leverages the existing VMFS filesystem locking mechanism. The locking mechanism uses a so called “heartbeat region” which is updated as long as the lock on a file exists. In order to update a datastore heartbeat region, a host needs to have at least one open file on the volume. HA ensures there is at least one file open on this volume by creating a file specifically for datastore heartbeating. 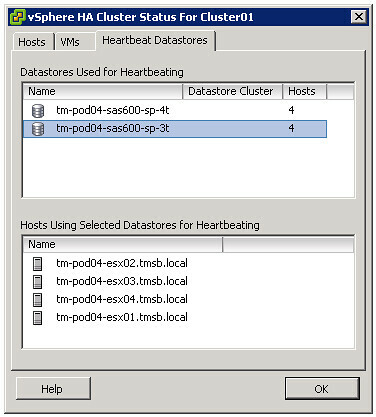 In other words, a per-host a file is created on the designated heartbeating datastores, as shown in the screenshot below. HA will simply check whether the heartbeat region has been updated. If you are curious which datastores have been selected for heartbeating. Just go to your summary tab on your cluster and click “Cluster Status”, the 3 tab “Heartbeat Datastores” will reveal it. ain’t it already a mechanism to check the lock files on the VM in HA before, in case the network was isolated, but the VM still up and running ? Or am I wrong ? Ok. I see. Thank you. Instead of a failure, you have here a check saying the VM is already running. i was not talking about the iscsi lock but about the check every one second, and the failure declaration after 15s of lost heartbeat by HA. The point is that it won’t even try to restart it … that will reduce unnecessary stress. If a host management network lost but datastore heartbeats still available, will isolated host run isolation response action? Yes it will. Datastore heartbeat has been introduced to make the distinction between a failed and an isolated host. Since this is a VMFS locking thing, I assume this can’t be used with NFS? Is there an alternative for hosts that are pure NFS? I suppose the footprint for the heartbeat region will be minute in regards to space consumed and iops? Now if there could only be a way for HA to figure out loss of connectivity on the VM traffic side and if HA could figure out a way to work with DRS in moving the VMs over to another host in case when a the VM traffic nics go down (for whatever reason)… that would be awesome.. I know I am asking for too much here.. but I am sorry I guess I am spoiled by VMware lol.. So if I understand this well for this to work correctly for iSCSI and NAS you need to have these networks physically seperated from your ESXi management network containing the heartbeat. Is this correct? So we are in a VDI configuration and for our Managemant Cluster we only used a single datastore from our array. We get the message that it does not have enough data stores to meet the requirement of 2. Can we safely ignore this on that cluster as our VDI hosts have multiple data stores and it is configured ok.
And if so can we disable the warning? Yes, you can set “das.ignoreInsufficientHbDatastore” to true! what would be the impact of having one shared datastore vs 2 for datastore heartbeat? What would be happened if the Master Host has lost connection to the Data Stores but the network heartbeat still working? Note: The Master Host “ESXi” is running on the local Disk, but the connection to the all Data Stores lost and management network for heartbeat is working fine. As long as the management network is up nothing will happen. This is the primary check. Only when the management network has failed will HA check the storage heartbeat. What would be the expected reaction from the remaining hosts that have still have full network and datastore connectivity? We experienced an event similar and VMs on hosts with full network and storage connectivity were behaving intermittently as if they had lost storage connectivity as well. it is very helpful. Could you please spare some time for my query which I am not comfortable with. How vcenter selects the 2 datastores, suppose if I have all the datastore shared among the esxi host in the cluster. How would the selection take place? which parameters to consider? Many Thanks. Many thanks for the reply. Could you please assist me which this scenario. What if I have 5 data-store and they all are connected to 12 hosts. How the 2 will be selected? Another query – if I have few RDM’s and iscsi attached to Host 3 which is having all the datastore connectivity and also there are some additional vms attached through RDM and iScsi. Will these (iscsi) data-store be considered? As I said, it uses the name/uuid of the datastore. RDMs are not part of it, only VMFS or NFS volumes. VMFS first, NFS second. Duncan – Thanks so much, I am very sorry to ask you again and again. I Couldn’t understand the priority set on the basis on name/uuid for VMFS provided if all the data stores shared to all the host. Could you please clear my doubt. Many Thanks.